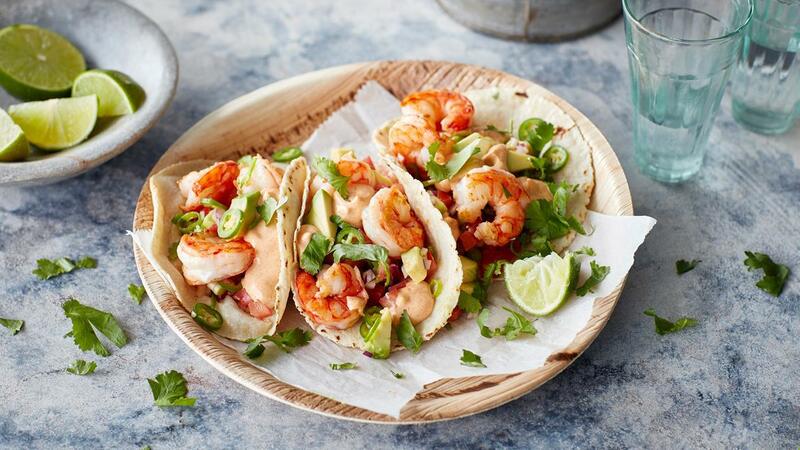 This modern Mexican taco combines roasted prawns, tomato salsa, avocado, and spicy chipotle mayonnaise- Ideal as a shared snack or a stand alone meal. Chop the tomatoes without the seeds into equal cubes. Mix with finely chopped onion, chili and coriander. Season with oil, pepper, salt and lime juice. Put a pan on high heat, add some oil and add the prawns and Knorr Professional Garlic Puree. Take a warm tortilla and start with the tomato salsa, add the roasted prawns and finish it with some avocado, green chili, coriander, lime juice and the chipotle mayonnaise.